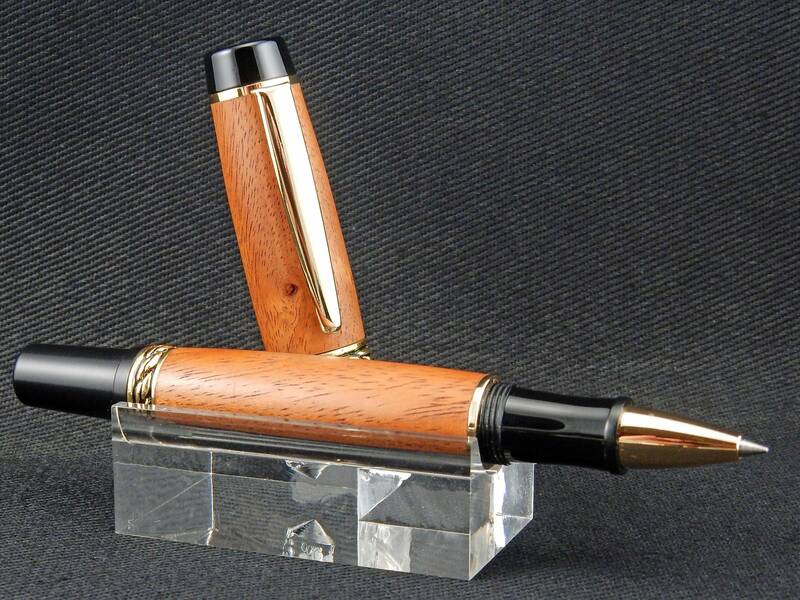 A truly classic look, this pen is hand-turned using the Palo Chino wood. Polished to a matte finish, this pen will be used and cherished for decades, possibly handed down as a family heirloom. Matched with black and 24k gold fittings, the pairing makes for a truly stunning writing instrument. Further complementing the burl is the 3D twisted rope pattern of the fitting's center and end bands. This uses premium German rollerball ink, either Schneider or Schmidt (or compatible size) refills available in office supply stores nationwide, for an exceptionally smooth writing experience. Alternately, the pen may be purchased as a fountain pen, which will include an upgraded Heritance nib, available in either fine point or medium. Simply make your preference known in the notes during checkout. The fountain pen accepts either a pre-filled disposable ink cartridges or the refillable reservoir (also known as a converter) for use with your choice of inks. Sale of a fountain comes furnished with both.